During your short-term financial needs, you may decide to pawn your Rolex watch to raise some quick cash, securing a safety pawn loan from any trustworthy pawnbrokers Hatton Garden. While more and more individuals today are turning to pawnbrokers for acquiring an instant loan, high street pawnbrokers are monitoring and working to make the pawnbroking process faster, more secure and straightforward. Rolex is universally recognised and by far, the most coveted brand both in the retail as well as the second hand market. Pawning a Rolex watch is an easier way to raise money when short of cash as most luxury watches retain their value well over the time. Although the higher demand depicts that getting a loan against your Rolex timepiece can be more convenient than pawning other fine watches, the real deal still lies in choosing a professional and trustworthy pawnbroker who understands the monetary significance of luxury timepieces like Rolex. With a trustworthy local pawnbroker in Hatton Garden at The Luxury Hut, you are likely to secure the highest amount of credit, getting a loan against Rolex in a straightforward and hassle-free way. Here are some points that can help you to have the best experience and obtain the best value possible for your asset from the Hatton Garden pawnbrokers. Have a look! One of the aspects that play a vital role in determining the value of a Rolex watch is the condition. Thus, before you walk into a pawn shop to pawn your Rolex, it is essential for you to ascertain about the wear and tear of your watch. While a shallow scrape in your watch’s case, bracelet, or bezel may not influence its value, scratches, blemishes or any other significant damage in any part of your watch as well as missing links can bestow a direct impact on the amount of credit that The Luxury Hut pawnbrokers in Hatton Garden are willing to offer you cash on your luxury timepiece. A pre-owned Rolex watch in mint condition may worth more than a watch in poor condition. The servicing history and its documents can help in assessing the condition while enabling the Hatton Garden pawnbrokers at The Luxury Hut to determine the actual price of your pre-owned Rolex watch. Keeping in mind that appearance may also contribute a lot to the credit amount you expect to obtain when getting a loan against your Rolex, it is crucial for you to ensure that your asset is clean and serviced regularly. With a well-cared and well-serviced Rolex watch, you are likely to receive the best value and ultimately, maximum credit amount possible from any reliable pawnbroker like at The Luxury Hut. Ideally, the most obvious way to get the best value when pawning your Rolex with The Luxury Hut is retaining its original box and documents. While the papers like the certificate, receipts, warranty card and servicing papers will ensure your watch’s authenticity, they may also help in determining the final price that The Luxury Hut is willing to offer for it. 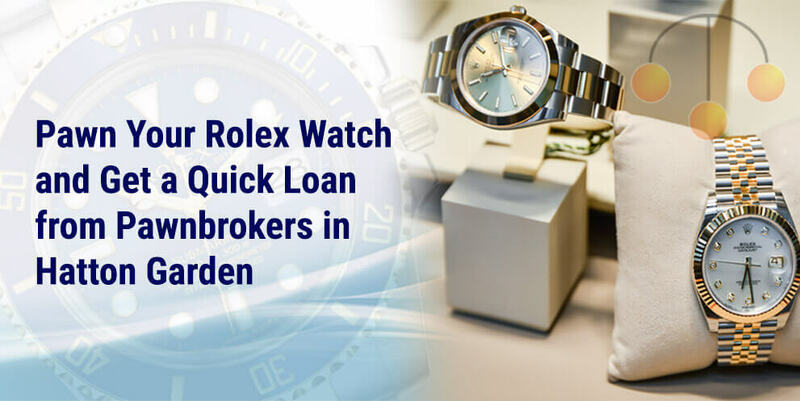 Although it is possible to pawn your Rolex watch without its box and papers and secure a collateral loan from a pawnbroker, you can always expect to obtain a better price with them and eventually, a higher cash loan amount. While it is indeed possible to carry out a pawnbroking process online in today’s internet era, attaching high-resolution and clear images of your Rolex watch and also, of the box and papers (if any) taken from every angle is essential when you pawn your Rolex online. High-quality pictures will not only help a at The Luxury Hut to perceive its condition better but also can help you to obtain the price you expect for your luxury asset. It may always be a good idea to receive an appraisal from some of the trustworthy pawnbrokers in Hatton Garden before you pawn your Rolex, be it is online or via appointment. While an initial valuation can help you to know the value that any high street pawnbroker is willing to provide you for your watch, it is essential for you to choose a reliable one who can offer you a fair and honest quote. With expert evaluators at The Luxury Hut, you are more likely to obtain the most competitive quote right away, and ultimately, the highest amount of cash loan possible for your asset. The process is quick, secure and convenient. To get started with it, fill up our online form, providing the details of your Rolex watch or call one of our associates on 0207 242 5411 to arrange an appointment for visiting our premises in Hatton Garden, London with your Rolex watch. Next PostNext How to Verify the Authenticity of a Rolex watch?